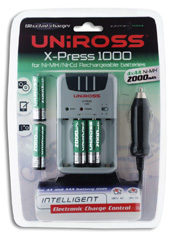 RC103619 X-Press 1000 Ultra fast charger for Rechargeable AA / AAA Batteries with 4 x 2000 mAh AA batteries. Type: Charger and 4 x AA 2000mAh battery kit. Input Voltage: 230V, 50Hz standard UK plug. 4 x AA to 'D' size converters. Price: £17.95. Postage and packing included. Dimensions of Charger: 10.5 cm. Width: 6.4 cm. Height: 2.3 cm. Indicator Lights: Green ‘Power On’ light indicates that the charger is in service and that power is being applied from the transformer/wall plug. Red ‘Fast Charging’ light indicates that charging of the battery is in progress. The Red light switches off to indicate the battery is fully charged and that no further charge is being applied. 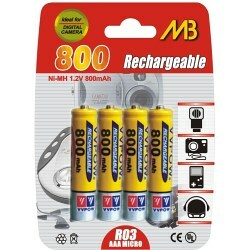 Battery Sizes: 2 or 4 batteries of size AA (R6, Mignon), or two batteries of size AAA (R03, Micro). Battery Type: Suitable for Ni-MH and NiCd batteries. Voltages: 1.2 V.
This RC103619 battery charger is compact and light. It will recharge AA and AAA batteries such as AA NiMH 2100mAh, AA NiMH 2300mAh and AAA NiMH 800MaH batteries. This is a neat and 'handy' charger. Power is from a combined transformer/wall plug or from a cigar lighter cord. 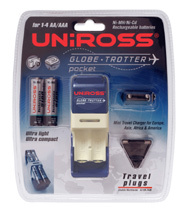 This Uniross charger has been designed to 'fast charge' the latest generation of NiMH batteries as well as older rechargeable batteries of a lower capacity. It has a rating of 800 mA and fully charges high capacity NiMH rechargeable batteries in as little as two hours and standard capacity batteries in only one hour. This charger and battery kit also includes four converter shells which convert AA size to 'C' cell (LR14) size and another four converter shells, which will convert AA size to 'D' cell (LR20) size. 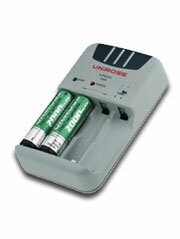 This allows you to use your high capacity AA size batteries in almost all equipment types around the house. This intelligent charger (with Electronic Charge Control) incorporates automatic end-of-charge detection and then switches to trickle charge, and also contains a safety timer that is set to 2 hours and 30 minutes. 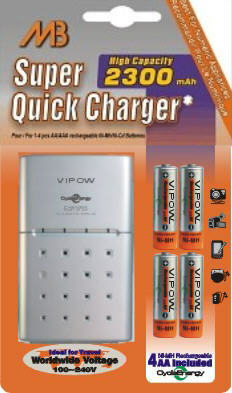 If you prefer a faster charger, require dual 240V/110V power for use abroad, require four independent charging channels (so you can simultaneously charge 1,2,3 or 4 batteries of the same type and capacity), or if you do not require a cigarette lighter cord you might like the Uniross SPRINT 1 hour charger. Or, consider this great value compact and light CR898 1 Hour Smart and Super Quick Charger with 4 AA Ni-MH high specification 2300mAh batteries. Or, for unrivalled portability with dual 240V/110V power for use abroad and four independent charging channels ( might like the Globe Trotter Pocket charger. 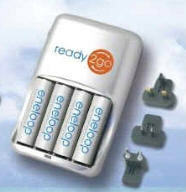 For a charger and 'ready-to-go' eneloop combination try this EN60 Sanyo eneloop travel battery charger with set of UK, Euro & USA plugs which comes complete with 4 x 2000mAh eneloop NiMH AA rechargeable batteries and charges from empty in three hours.